Born: October 19, 1889 in Cataumet Ma. 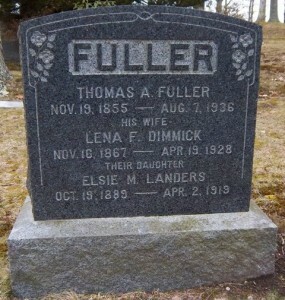 Died: April 2, 1919 in Bourne Ma. at 29 yrs, 5 mos, 14 d.
Married: February 14, 1915 in Wilsall Mt. To: Harrie Bion Landers; (1890 – 1975) (Bion Andrew Landers & Carrie Hennes); Harrie married (2) Mabel (Moyle) Lounsbery (1898 – 1968) (Solomon Moyle & Hadesseh Bickey) in Harlowton Mt. on April 3, 1926; Mabel married (1) Alonzo William Lounsbery (1893 – ?) (Andrew J. Lounsbery & Ida Kennison) in Butte Mt. on October 11, 1919. 1. 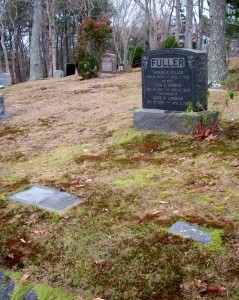 Harrie Fuller Landers; (April 1, 1916 – May 13, 1971); Married Dorothy Gifford Slocum (1914 – 1964) (Lester Arthur Slocum & Jeanette Gifford) in Bourne Ma. on May 21, 1942; Harrie was born in Wilsall Mt. ; He & Dorothy are buried in Cataumet Cemetery. 2. Thomas Bion Landers; (October 10, 1917 – December 19, 1971); Married Doris W. Wing (1916 – 1998) (Charles Joseph Wing & Emily Madora Lewis) in Bourne Ma. on July 6, 1939; Thomas was born in Wilsall Mt. ; He & Doris are buried in Cataumet Cemetery.